MANILA — Special Assistant to the President (SAP) Christopher Lawrence “Bong” Go on Thursday urged members of the Lex Talionis Fraternitas, the fraternity of President Rodrigo Duterte, to help in the administration's fight against corruption. “I ask the members of Lex Talionis Fraternitas to help the President as he addresses the problem of corruption in our society. There are people in the government who undermine our gains against corruption by abusing their positions for their own personal benefit. The President abhors this so I ask you to be vigilant and help us eradicate this social problem throughout his term,” Go said in his speech during the fraternity’s 49th anniversary. Go, who was declared an honorary member of the fraternity, also lauded the group for its brotherhood and loyalty to the country. “One of the traits I have always admired with your brotherhood is your unflinching loyalty — loyalty to the fraternity, loyalty to your brothers, and loyalty to the people whom you believe can change the nation for the better. And I thank you for that kind of loyalty you give to President Rodrigo Roa Duterte and the trust that his programs and its fruits will benefit Filipinos and the greater good,” he said. 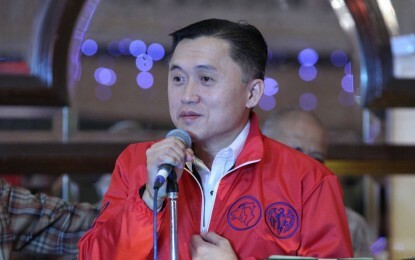 In an ambush interview, Go said the fraternity has been helping the administration in handling the country’s problems. “Tumutulong talaga sila sa ating Pangulo kung paano ang pamamalakad natin, ni Pangulong Duterte, na labanan ang ating korapsyon, kriminalidad, at droga. Tumutulong po itong mga brods niya (They are really helping the President in fighting against corruption, crime, and drugs. President Duterte’s fraternity brothers are helping),” he said. Go added that even if there is the presence of fraternities and brotherhoods, Duterte remained fair and unbiased when it comes to eradicating criminality, drugs and corruption.